customer experience. They maintain strong relationships with globally recognized brands such as Nike, Jordan, adidas, Under Armour and more. They offer the best selection of brands and styles that connect with their customers dynamic lifestyle. Their product assortment focuses on everyday sport footwear but is also worn by their consumers for fashion. They compliment their best in class footwear selection with the right mix of premium apparel and accessories. Their Winners Circle loyalty program allows users to sign up to receive rewards, specials discounts and perks just for being a member. They also offer additional savings on select products with exclusive deals, coupon codes, promotions and seasonal sales. 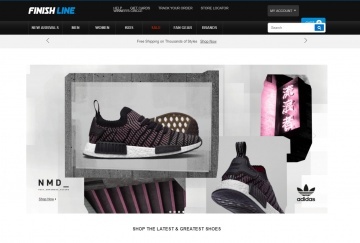 Finish Line also offers free shipping on thousands of styles everyday. Cash Back not available on the purchase of all Air Jordans, Adidas NMD, Adidas Ultra Boost, Adidas Pure Boost, or gift cards. Click a Coupon or click Start Shopping to earn 4% Cash Back at Finish Line.